Perhaps this is because the ones I’ve come across for my body type (hourglass with short legs, a “skittle” in Trinny and Susannah’s system) don’t work for me, but I don’t like clothing recommendations based solely on body type. While I think Kibbe does try to create balance and harmony within a type, he does not do what many of these systems try to do, which is to create curves where there is none and minimize curves when you do have them, and just generally try to make everyone the same. I think the woman looks decent in the outfit on the right, although I’d never wear it myself. The picture on the left, however… If that was how I had to dress on an everyday basis, I’d probably stop buying clothes altogether and give up completely. It took me a solid five minutes to figure out that it wasn’t a set of “before and after” outfit photos. Regardless, while only one of the outfits is truly terrible–I can’t imagine it looking good on ANYONE–neither of them would be suitable at all for a Flamboyant Gamine like me. While I think sites like Imogen Lamport’s can be useful, for me, I don’t find them particularly helpful. I find it much more helpful to first of all follow my FG recs, and second, to just try on different clothes in order to understand what suits my body. 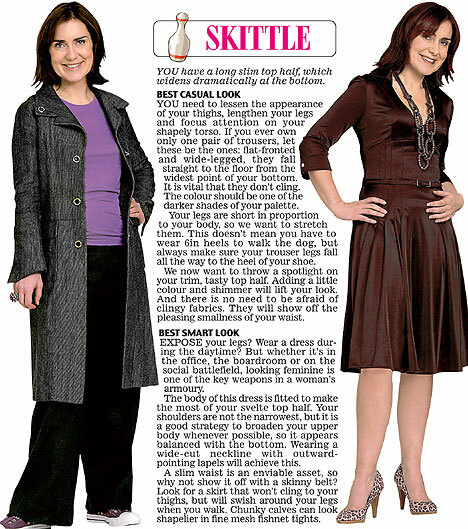 Do you follow the recommendations for your body shape? Do they conflict with your Kibbe, the way mine do? Uh yeah! One of my “favourite” topics. I should wear A line skirts, because I’m a pear. I shouldn’t wear high waist skirts due to my shortwaistedness. I should wear monochromatic outfits to elongate my tiny curvy frame (and high heels, too!). Guess what, this is the perfect opposite of what Kibbe tells me. While he’s right, those fruit types are not. HAH! hahahah we need a slogan: WOMEN ARE NOT FRUITS. I bought that book years ago, figured out I was a Skittle, then cried (well, no tears were shed but it was a bit depressing). I think that body type dressing doesn’t work because it really is your face that you are dressing. As a Kibbe N, even though that category doesn’t exist anymore, I can’t wear the flounces and ruffles on top meant to “correct” a smaller top half. It took me a long time to learn that when trying on clothes it is more productive to focus on whether the outfit flatters your face. If your face looks gorgeous, who cares if your legs are a little big. I’m not sure if I’m convinced that it’s entirely your face–although it certainly works for me, as an FG with an SG body but an FG face–but you’re absolutely right that you can’t consider your body in isolation from your face. As an N type, though, you probably also have a different bone structure than a TR or something would have. I think you have to look at everything all together. I recall hearing from someone who went to see Kibbe that they had a Romantic face and an SN body, and he put her in SN. But someone like Charlize Theron has a body that seems maybe even FN, but Kibbe stuck her in TR because of her face. I suppose it all depends on what dominates about a person. On the one hand, it was nice to have a body type category that actually described my body. Pear or hourglass wasn’t really enough. On the other hand, the recommendations are terrible, and I don’t understand the point of balancing everything. Plus they’re ugly. The Art of Dress, although it’s not completely launched yet, is a system that has its roots in Kibbe but defines types based entirely on the face. So this question is definitely still on my mind, and I’m waiting for that site to launch officially so I can explore this idea further. You are probably right that it isn’t entirely the face – I was overstating it a bit. But I do think that the outer lines of an outfit should reflect the lines of your face to some extent, especially if your face has straighter lines. A very curvy silhouette on the bottom (even if it is your body shape) can make an angular face look very hard. A curvy face and straight body does not have the same issues because of its youthful appeal. A guess I am talking about the issue of a yang face and a yin body. I love your blog by the way! And thank you for supporting us Kibbe N types in your other post! Thanks! Yes, I agree. I have a yang face and a yin body, and in my case, it’s very important to follow the yang lines of the face.